In my article this morning, I stated that Americans are war weary and when the anger related to the tragic death of Kayla Mueller subsides, Americans will resist supporting the commitment that World War III will require of all us in terms of labor, capital and the sacrifice of personal liberties. And make no mistake about it, the coming war is not about Kayla Mueller as a war is never about the death of one person. When American forces pursue ISIS into Syria, Putin will respond in force. Putin has previously threatened to nuke the United States if it invaded Syria in violation of international law. Syria is critical to the Russians on a number of fronts. For a complete explanation of the dynamics related to Putin’s threat and the Federal Reserve’s overt strategy to invade Iran and how Syria factors into this equation, please click here. This is the beginning of World War III. Through the 20th century, America has been a nation which has jailed war protesters in ever-increasing numbers (e.g. World War I, internment of Japanese-American CITIZENS in World War II, and of course during the Vietnam where deadly force was even used at Kent State in 1970). Even Lincoln jailed citizens and journalists who have dared to object to the draft during the Civil War. “SAN FRANCISCO — President Obama will announce a new executive order on the sharing of cybersecurity threats and information at Friday’s cybersecurity summit at Stanford University, the White House said. One of my colleagues in the media sent me the press release. Within 15 minutes, I had two very high level confirmations of what this meant. One of the sources is a high ranking government official with oversight responsibilities and the other is an ex-military intelligence asset with multiple and strong connections to dissident military types serving today. However, this is a story that writes itself. I really do not need unnamed sources in order to demonstrate where this is likely headed. The President’s intention to transfer intelligence information on American citizens from the NSA to the DHS is both ominous and the purpose is self-evident. My sources simply serve to reinforce the obvious intent. Also, this information is beginning to leak out in the independent media. Anyone who has read my articles over the past two years knows that I have obtained information that the NSA’s massive data mining of every person is inextricably tied to creating a Threat Matrix Score for each and every American based on key word analyses of their cell phone conversations, emails, social media statements, etc. Also, a “known associates” file is maintained to determine the amount social reach a potential dissident has. For example, the bigger their reading audience or listening audience or Facebook following, the higher a person’s Threat Matrix Score. Visionaries such as Steve Quayle and Doug Hagmann have been warning us for decades about the creation of a so-called “Red List”. The Red List is a modern-day interpretation of Nixon “Enemies list”. However, what is happening today is much more nefarious. The “Red List” is a “dissident removal list” and it will be conducted with extreme prejudice. The people who have referred to such lists and those brave enough to expose them, as “fear-mongers”, may soon change their tune. After reading this article, these people are going to have a little harder time sleeping tonight. Why Is Obama Transferring Intelligence Gathering on American Citizens from the NSA to the DHS? This is the $64 million dollar question. When the NSA gathers information on Dave Hodges, the information may be shared with the Fusion Threat Centers and various domestic law enforcement agencies. However, the NSA’s intelligence is not immediately actionable. For NSA intelligence to be acted upon, a second generation set of agencies have to be involved. This is cumbersome and slow. Who are the bullets for? Who has the ability to oversee intelligence gathering and simultaneously act upon the intelligence? It is none other than the Department of Homeland Security. 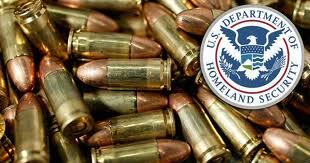 It is also the DHS that has, in the past two years, acquired 2.2 billion rounds of ammunition as well as 2700 armored personnel carriers, not the NSA. It is clear that DHS is the army of the central bankers who have hijacked our government and they are preparing to remove dissidents. Keep in mind that this coming war is a war to preserve the Petrodollar and it will be waged at all costs. All opposition will be eliminated. The optimistic part of me would like to believe that this transfer of power is only about streamlining our war on terror, then I am reminded who started al Qaeda and ISIS. There are two programs designed to round up people who are viewed as a danger to the status quo. The two operations are labeled “Operation BOA”, as in boa constrictor, and “Operation Lightening”. I have some operational details, but at this point they are still sketchy. Suffice it to say that Operation Lightening is the 3AM round up of all perceived dissident journalists and even some local politicians. This will be accomplished on a single night of terror. Operation BOA is a more deliberate process and will focus on more non-media threats such as outspoken veterans, gun rights activists, etc. Martial law will not be called martial law, it will be labeled as “Continuity of Government”. The announcement of the procedures designed to enhance the “Continuity of Government” policies will be made by a four star General from NORTHCOM. There is no definitive timeframe for this announcement. Logic would dictate that it will come in close proximity to launching new ground operations in the Middle East against the CIA created ISIS. There is no need for you to be concerned about what you say on Twitter, Facebook, on the phone or in print, that ship has already sailed. You already have a Threat Matrix Score and that score could eventually hold very significant consequences for you and your family. Can anything be done? Probably not. However, the only thing that I think that may actually back up the enforcement of this plan is if enough people express awareness and outrage as to these violations of our 4th and 5th Amendment rights. As I wrote about in this morning’s article, this actionable intelligence will be supported by the NDAA and Executive Order 13603 which involves civilian round-ups (NDAA) and civilian conscription (EO 13603). In the interest of self-preservation, it would be a good idea to circulate this article and the dozens that will certainly follow on this topic. How many people do we have to reach? The magic number needed to enact significant social change is 10% according to social psychology research. That means we have a short window to head this off.